Now available through Finishing Line Press or Leah Stenson. It’s refreshing to see a woman writing so freely and openly about love and about the physical body during romances. 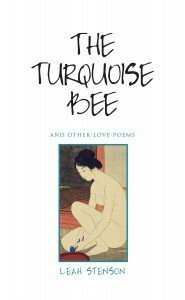 The Turquoise Bee is full of flowers and night-dancing, of time and loss and being enriched by experience. I cherish these poems. Stenson’s eye and concern of the intimate other is to be admired.